This update is free for MagicPlot Pro 2.x users. Just download and run the new version. See also: Manual topic on Color Map Plots. Set the number of equal color intervals. Left mouse button + scroll – proportional scaling. Plot dragging and zooming with mouse is smooth even with table of size 1000×1000. 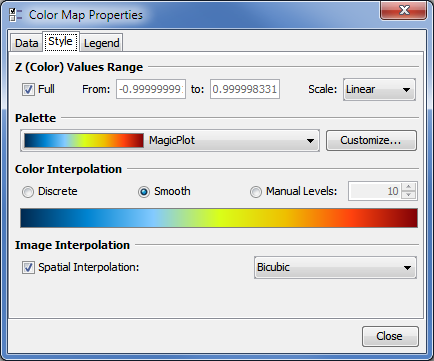 MagicPlot supports saving of color map palette presets. These presets are stored in .mppc files. See also: Additional Color Map Palettes. 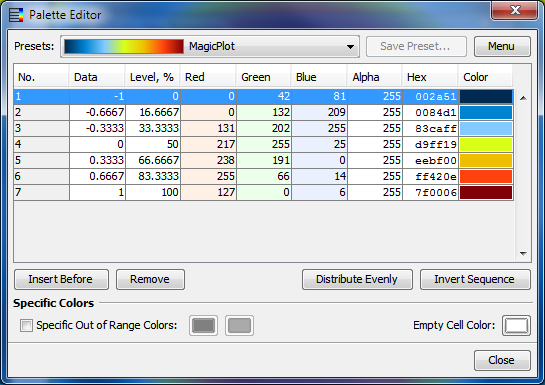 In the freeware MagicPlot 2.7 Student edition text and drawing tools from the Pro edition are now available. Many enhancements and bug fixes were made based on the user feedback and testing. The full list can be found in release notes. In nonlinear fitting algorithm in MagicPlot 2.5.1 and older, if Y error column(s) were set, weights of points were normalized so that the sum of weights was equal to one. The resulting chi square value shown in the 'fit report' tab in old releases did not take into account the real Y error amplitudes. In MagicPlot 2.7 the point weights are not normalized and the chi square is calculated correctly. Note that this modification does not affect the resulting fit parameter values and standard deviations which were calculated correctly in all releases. See also: Fitting Algorithm and Computational Formulas.